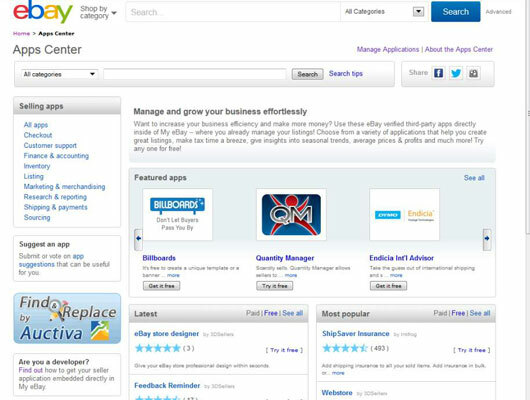 A visit to the eBay App Center will dazzle you with hundreds of third-party applications that have all been verified by eBay. Such verification means that these apps should always be up to date and ready for any of eBay’s changes. You’ll find apps designed for many functions that fall into categories such as checkout, customer support, finance and accounting, inventory listing, marketing and merchandising, research and reporting, shipping and payments, and sourcing. They integrate directly with the eBay.com interface for sellers in the United States. The apps are the brain-children of developers who have been vetted to join the eBay Developers program, and they’re offered in the eBay App Center only after rigorous testing. When you visit the App Center, you find reviews and ratings from other eBay sellers. Take the time to read these comments to see whether an app is right for you. Find the eBay App Store from your my eBay page by clicking Applications and then the Apps Center link. You can also find it here. Although the Apps Center has many choices, you may find that sometimes you need a more robust program to better fit your business style.